This bad UI decision has now been cleaned up. New icon (instead of Recycle) and more prominence for the likely default button preference. Thanks to Tim Rice there is now an Esperanto translation of the character sheet. Great on any screen: desktop, tablet, and phone. Installable to your device, just like a store app. Multilingual: English, French, and Spanish currently. Multi-system: Open Legend, D&D 5e, and Savage Worlds currently. OL Only: NPC generator built-in for two-click creations. Multi-device syncing and online backup available. At just past midnight, the morning of Dec 3, I instituted a code change for auto-logging in folks who had a Remember Me cookie set. Since I tested it with my own account, and through a strange and horrible bit of luck, I didn't notice a serious bug. This bug made every person who accessed this site (with a cookie set) me. Luckily, people were very cool about it and I got a good laugh at my altered HeroMuster profile description, "I screwed up somewhere." At 9pm MST on Dec 5, the real cause was finally discovered, patched, and everyone who was 'me' was cleared from the system. No other accounts were exposed or compromised, and by accessing the site as my personal account there was no way for a user to access data about any other users, so the only risk here was to my own accounts. So, this wasn't a security breach. Nothing was compromised. It was an inconvenience however, as many users couldn't properly save things to their accounts without logging out and logging in again, and I'm sorry about that. When adding the feat Defensive Reflexes beyond level III, the View Available Feats button will now properly flag the Defensive Reflexes II prerequisite. Thanks to a volunteer (last month!) there is now a Russian (Русский) translation of the character sheet. The NPC generator now has a few editable fields: Name, description, hit points, initiative, speed, guard, toughness, and resolve. Secondarily, if you are logged into your HeroMuster account, a new save icon is available which will save the NPC to your account (i.e. My Creations). My Creations is now wider for larger screens to accommodate the new NPCs column. Deleting an NPC from My Creations removes it forever. It exists only for you. NPCs can be tagged just like characters and items. Clicking on an NPC's will bring up its stats. Note: Unlike the NPC generator page, a saved NPC will not have all the extra helper weapon, bane, or boon information. The Battlefield Punisher feat will now prompt for a bane to inflict and add that to the Feat's title. Thanks again to the awesome community, the character builder is now available in Chinese (Traditional). Fixed printing in Chrome/Edge/Safari. Apparently, ~2 months ago Chrome changed how it interpretted font sizes. Anyway, the character sheet now prints properly as a one-sheet on all browsers again. This was reported to me by a user whom I am grateful to for doing so. The Tour was removed from the character builder... it no longer was critical since the builder is now full grown in its power and accounts are now a thing. If your browser has your HeroMuster Remember Me cookie, you previously still needed to click Login and then had a quick redirect loop to HeroMuster proper and back to the OL site. Now it all happens on this site. Browsers without the cookie will still need to click Login and follow the regular procedure. Both the Character Builder and the Extraordinary Item Builder now have a new icon when logged in and viewing a save you do not own. This bookmark icon allows you to add that save to your My Creations page without having to Save a new copy. There is now also the ability to bookmark an item from the My Creations page by providing the URL or tag for that character/item (new button visible). As a GM for my local game, I realized I wanted to keep a copy of my player's characters... but as they level, my copy was out-of-date. This new feature allows me to track the character sheet that they overwrite when they level, keeping me up-to-date as well. If your browser session dies due to inactivity (e.g. when leaving a character sheet open for an hour without interacting) and you try and overwrite a save (logged in accounts), previously it would just spin forever. Now it fails nicely, notifying and linking you to login again. Thanks to volunteers there is now a Dutch (Nederlands) translation of the character sheet. You can now properly click Confirm to save details when Feats prompt you for additional information (e.g. Extraordinary Focus). You can now set your account level language preference through the HeroMuster Account page. If set, when logged in and visiting the character builder (new or saved character), it will automatically use your preferred language (if available). Language selection design has been… redesigned. Now cleanly across the top of the page (better for mobile visitors). Coming Soon: Setting your preferred language in your HeroMuster account which will automatically change the character sheet on load. Labels in the form of Tags (My Creations) and Attributes/Banes/Boons (EIB) now properly wrap when you have lots of them (previously they were not accessible off the side of the browser window). Tags are now sorted alphabetically on page load (created tags will not be placed in the correct order). Mobile users now have an icon to scroll between their character list, item list, and the bottom of the page. Legendary properties are now available in the builder so it can make Extraordinary and Legendary items. Fixed an issue where you could press Enter to submit an input field (Name, Area, Slaying) triggering unwanted effects. Tagging is now enabled on My Creations. Tagging is an easy way to organize your characters and items. This allows you to visually reduce clutter, specifically by clicking a tag at the top and hiding all characters/items that do not have that tag. Selecting multiple tags will act as an OR: Showing any characters/items that have any of the selected tags. Full Site: Character Builder, Extraordinary Item Builder, etc. Fixed a few stray HTML markup issues. These fixes may have had the added benefit of getting the builders to work in the Safari 5 browser (found on Apple iPad 1st-generation devices). When selecting the Longshot feat you will now be prompted to select the specialization (weapon or attack type). Tooltips are now linked to tap/hover on the attribute name rather than score. Previous behaviour was frustrating to use on a touch device like a tablet (why don't people tell me these things?). Corrected the wealth calculation. Previously added WL only based on banes lowest PL and the attribute -> WL cost table, neglecting an additional +1 WL cost. Weapon tooltip will now show (besides Banes) if an item is Swift or Slow (nothing extra shown if neither). Updated weapons list to be up-to-date with final core release (I was missing a few things). Weapon dropdowns now alphabetically sorted. The Description and Special text areas now support a limited subset of Markdown (see below). That means you can add some styling to your item text. REMEMBER, just because you can doesn't mean you should. Want to test it out? Login, create an item or character and save it. Reload the page (the URL should have automatically changed to the saved link). Tada, new icon! When choosing the Damage or Weapon property and the Other choice, the item properties shown on the left are now editable, meaning you can click in and manually type in what Other represents. A new landing page for My Creations shows if you are not currently logged in. Previously it redirected you. Now you get a preview of the page in the background and a simple message instructing you to login. My Creations link now visible on all pages of the site. The ability to remove characters/items from the page (with an undo, just in case). A button to import characters from a particular player name. The list is automatically sorted with the most recent at the top. TODO: I'm planning to add a feature for logged in players to have a new button on the builders to overwrite the existing save rather than the default behaviour (save a new version). Done! The character builder and extraordinary item builder now have a new link in the top-right: Login. This new link will bring you to the newly minted HeroMuster login page (and consequently account creation page). Why would you create an account? Because it unlocks the My Creations page (not visible without an account) where you will see all of the characters and items that you save going forward* while logged in. If you have feedback or problems, feel free to reach out via email: contact@heromuster.com. You can add a password or authenticator (2FA) during account creation, but the account page doesn't exist yet to do this after initial creation. * I'll setup a way for you to quickly add all of the characters you've already made under a particular player name without having to resave them. Done! The ability to delete items from My Creations (won't destroy the items, just remove them from your account's list). Done! More stuff I can't think of right now because this week-long project has ended in a 17 hour binge of code. Armor and Weapons will now display the associated wealth level in the properties (as a guide), but it is not added to the item's WL calculation as these special properties have the requirement of acquiring the item rather than a cumulative cost. Added disadvantage tooltip for Area calculations. Moved Weapons to the bottom (alphabetical placement) of the list. You can now retrieve saved Extraordinary Items via the API. You can now retrieve a list of recently saved Extraordinary Items via the API. Button tooltips for item properties will now display even after a property has been selected (they were previously hidden due to a visualization bug that has been resolved). Extraordinary Item Builder: Save and Share! You can now save your work and share those links with others. The builder should also continue to work if you wish to revise a shared item. Retrieving a list of items you have created will be done differently than the current method used in the character builder. In the near future, saves will be linked to your HeroMuster account (coming soon). Special thanks to @Brycelor once again for the first of these pregens. When you apply Attribute Substitution, then change the score of the primary attribute, it now immediately updates the sheet to reflect the change to the dependent attribute (e.g. Guard updated in an Agility->Might substitution with the new score). Whoops. Forgot the Persistent property. It's there now. The Special section has Powerful label renamed to Modifier to avoid confusion with the item property Powerful. Since Banes and Boons added to items specifies the attribute score to invoke, rather than the power level, the dropdown now shows the power levels first, then a divider, followed by all other valid values. 99% of the time you will be choosing a score that is equal to the power level, thus why they are right at the top. You can now play to your heart's content building different extraordinary items. While there currently is no save function, you can print the page for a nice single-sheet handout to your players (or print to PDF). Add Save and share functionality, like the character builder. Create the mundane item builder (as described in chapter 6). Create the legendary item builder (maybe). Added both Deutsch (German) and Português-Brasil (Portuguese-Brazil); long overdue. You can now choose to sort filtered feats by cost, then alphabetically (low to high). A new dropdown is now available in the Filtered Feats… section. The default behaviour is unchanged: Alphabetical sorting. Previously, if you were to request a character with a character name and thus an id similar to namehere123, if that character save was deleted but the link to that character still existed somewhere, anyone clicking that link would be redirected to a blank sheet. Now, the system will try to find the most recent similar character save (based on character name) and redirect you to that instead. This will lead to false positives, but most of the time it will result in a better user experience rather than dead links. Using Postman, I've created a more robust API documentation and added the link to the main menu system. Just like Banes and Boons, you can now filter Feats based on your Attributes. Be advised that it will not exclude Feats based on feat prerequisites (they will be returned). Put a space back in the field so that you can edit it properly. Whoops. When filtering Banes or Boons, Attributes where greyed out if they were not applicable (based on the filter). This effect is now also applied to Power Levels. Note: If a Feat or Weapon enables you to make the attack at a higher power level, this is not taken into account. The meta data (title/description when sharing the link) for saved characters now reflects that character rather than being generic (to match the custom image/screenshot of the character sheet). Attribute descriptions are now part of the translations. Currently only English and French are available. Fixed a display issue for prerequisite requirements when viewing Feats on a mobile device (e.g.phone or tablet). This included improved use of space. Improved the code so that the API automatically parses an invalid result (e.g.Great Moustache) into a valid one: greatmoustache. This uses the same logic as the character builder uses to generate a player id. Battlefield Reflexes prerequisite filter renamed to Battlefield Retribution to match the core rules update. Armor and Feat bonuses in Guard and Toughness, respectively, properly change when feats are changed (up or down). 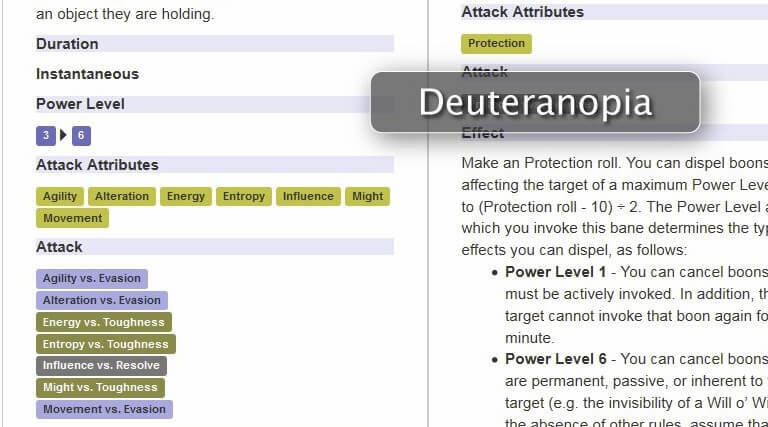 Previously, reducing Natural Defense X to a lower tier would leave the Toughness Feat bonus unchanged and incorrect. Updated the tooltips for Logic and Learning per this thread. Updated references in Multi-Attack Specialist of Projectile to now use Ranged per core changes. Added additional calls based on the HeroMuster data that powers the lists used in the character builder, now available through the API. Special thanks to @Brycelor on Discord again. Fixed a bug where Natural Defense and other Feats that effect the armor bonus in Guard were being doubled when loading a saved sheet. This also fixed a few other minor bugs related to the same feats being removed or changed. Minor QoL (Quality of Life) improvement: submitting a request to /api/banes or /api/boons without providing attribute scores will be treated as 9s for all attributes, showing all possible options. Fixed a bug where The Primary Attribute in Attribute Substitution would have incorrect 'cost' and 'dice' columns if interacted with or changed AFTER the feat was taken. Improved 1 page printing for the blank character sheet (no more blank second page or Additional notes appearing on page 2). Fixed a bug where manual changes to Defenses sub-values were being overwritten (recalculated) when retrieving a saved character. For example, the Flash, where the benefits from Haste have been manually added to Guard and Speed due to his Boon Focus III (Haste) and noted at the bottom of the sheet. Using the NPC quick build rules, you can now retrieve a full NPC of levels 1-20, including Name, Description, HP, Attributes, Defenses, Attacks, Initiative, Boons, Banes, and even Feats! The attributes are weighted, so that the NPC has a higher chance for more combat-focused attributes. If an NPC has an attribute that contributes to a defense score or HP, it increases the minimum possible score that is randomly selected. The number of attributes and feats increases as the level of the NPC increases. Feats select relevant banes/boons from what is possible for the NPC, including the complex Multi-Bane Specialist feat. The names and related descriptions are randomly selected from a stored list of legendary and mythical creates from around the world, sourced from Wikipedia. A future update will outline some of the extra features built-in to increase the chance of a viable NPC being generated. Updated all weapon wealth levels (core changes), including removing some that are no longer part of the main table. Fixed a bug causing the View Feats/Banes/Boons links to fail if an Attribute score was greater than 9. When viewing filtered Boons and Banes, attributes will now be grayed out if the attribute doesn't meet the minimum power level requirement, to make it easier to identify what attribute qualified the character to use that bane/boon. There is a new field returned, validAttributes, to programmatically display which attributes meet the minimum power level requirement. The following feats will now add their Guard bonus as an armor bonus rather than a feat bonus: Defensive Mastery, Natural Defense, Two Weapon Defense, and Armor Mastery. The View Available Banes/Boons links will now reflect Attribute Substitution only when the character has Tier 2. The Current and Lethal Hit Point boxes are now content editable. Armor warnings for Fortitude value now properly aware of Attribute Substitution. You can now hide the language box for better readability on mobile devices such as tablets. Special thanks to @Brycelor on Discord, there is now a full deck of 5 Western genre pregen characters. Initial character design goes to him; I only cleaned up, filled out, and standardized. The View Available Feats button is now Feat aware. That means that it will properly filter based on selected feats, excluding any feats which you do not have the prerequisite feat. Reminder: The tool will not warn you if you select a Feat where the character does not meet the prerequisite attributes or feats. This change is an effort to not expose those feats to you in the first place. When changing the Attribute Substitution feat without deleting it first (instead just selecting it from the dropdown), icons will no longer double-up and will be properly cleared. Altering the primary attribute's value after selecting the Attribute Substitution feat will now properly update the dependent attribute in the background, triggering updates to Defenses, HP, etc. You can now use HeroMuster's filtering programmatically through the API to see which Boons and Banes are available based upon attribute scores. Maximum attribute score warnings updated to fit new official rules. Indomitable Resolve properly applies benefit to Resolve. Trist has been updated due to recent changes to the Two Weapon Defense feat. When the character level field is blank and selected, it automatically sets it to level 1 (this already worked). However, the fix is that it will properly remove error highlighting on attribute spent and feat spent now that new totals are set. Feat prerequisite filter updated inline with core rules. Pregenerated characters based on real-world heroes. Currently features Ida Lewis and Lyudmila Pavlichenko. Deleting Attribute Substitution feat now properly cleans up after itself. Previously, it would break horribly. Attribute Substitution now provides icons (that print) and tooltips next to the attribute names to better communicate that it has been applied. Natural Defense now adds Toughness as well (instead of just Guard). Indomitable Resolve now exists and auto-calculates Resolve bonuses. Bane Focus III now displays time as Free Action. Reminder: For existing character saves, you must remove and then re-add the Feat to get the new calculations, then save the new version. You can now access stored character info programmatically based on player id, character id, or show all (50 at a time). I hope that this allows even more great tools for the OL community, such as a native mobile app that uses this import existing characters created by the user. New Feature: Character Sheet Social Images! Any new saves will take a bit longer to process because the system will be generating a screenshot of the actual saved character sheet, so that the image shown when shared on social media (and Discord) is not the placeholder (which is what shows if it's an old save or the screenshot generation failed). Italian (Italiano) translation added at 90% completion. Armor Mastery feat is now integrated into automatic calculations (Feat bonus to Guard defense, fortitude requirements, and speed penalty reductions). Be advised that as specified in the feat, the bonus will only present if an Armor Type has been selected. Boon Focus is now smarter. Previously, changing from Boon Focus III to Boon Focus II (or deleting the feat) for the same Boon would not reset the Boon speed. Now, the system actively rechecks and recreates the benefits of Boon Focus when any Feat is changed, just in case. Boon Focus and Armor Mastery will now work properly when loading a saved character and making further edits. Line breaks are now properly saved when using Chrome; typically used in NOTES, EQUIPMENT, and DESCRIPTION. Attribute line-height shrunk 12.5% to allow for two additional Feat rows. Tab index adjusted appropriately. Feats are now properly sorted alphabetically (specifically Boon Access was out of place and roman numerals were alphabetical, not fuzzy). Hand Crossbow added to weapons list (custom weapon builder coming in the near future). Heavy Armor (WL4) Fortitude requirement fixed (1, not 3). Armor now also triggers highlight warning for Wealth if it is lower than the armor's requirement (much like it highlights the armor if it is above your current fortitude). Removed some of the excess space in the dropdowns (left/right padding) especially for printing. Should reduce the chance of Feats breaking to two lines. Preferred Boons names column has been shrunk a little to allow a full size attribute box. Fixed a bug that I introduced with the Multi-Target Attack Specialist helper modal that broke HALF of the other modals. They now all work again. New Feature: Character Sheet Translations! Volunteers can translate the printable character sheet into other languages by going to OneSkyApp, creating a free account, selecting the language to translate, and translating the 90 words/phrases! 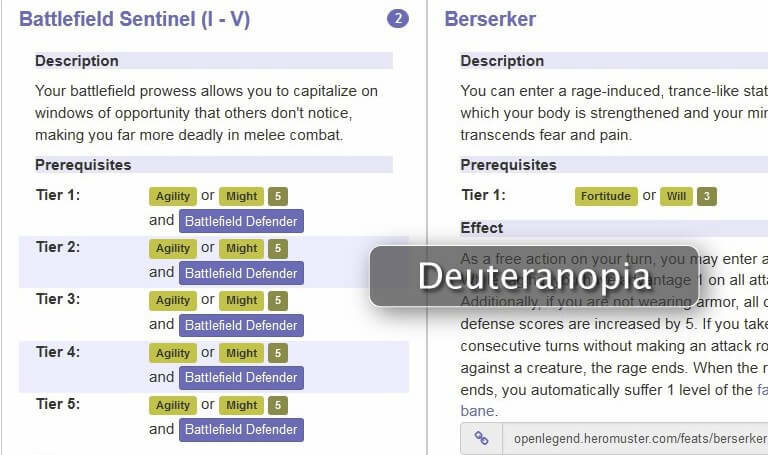 Currently includes 10 Fantasy Genre pregenerated characters that you are free to use to give new players or one-shot players someone fun to play, all with unique traits and room for the player themselves to add their own flavor. Companion no longer requires picking from a modal. The Multi-Target Attack Specialist feat now offers a selection helper (Area, Projectile, Melee). The Attack Specialization feat now offers a selection helper. After selecting a weapon, a new tooltip will show you the Banes associated with that weapon, to make it easier to create your Actions. The following feats now offer helpers (parenthesis): Craft, Knowledge, Energy Resistance, Hunter's Foe, Marksman, Extraordinary Focus, Martial Focus, Companion, and Alternate Form. The Skill Specialization feat now offers an attribute selection helper. Preferred Boon properties that are manually altered from the default (e.g. 1 Minor Action rather than 1 Major Action) now save properly and show when retrieving a saved character. Boon Focus will now automatically alter existing or future Preferred Boons (e.g. Boon Focus II switching 1 Major Action to 1 Minor Action). Be advised that this doesn't work on saved characters if Boon Focus is already selected and then you add the boon to the list. Sixth Feat row added. Fourth Boon row added. Removed caching so firefox specific styles don't effect chrome. Attribute Substitution, upon selection as a feat, will now properly alter the links for available feats/banes/boons as well as effect hit points, defenses, and initiative automatically. Defensive weapons now grant +1 armor per upcoming update. Defensive Mastery now adds +1 armor if weilding a Defensive weapon. The feats that require identification of a specific Bane/Boon now offer that ability: Multi-Bane Specialist, Bane Focus, Boon Access, Boon Focus, and Potent Bane. Manual line breaks (such as in the new Notes section) will now save properly as well as restore properly. This only effects saves from now going forward. Added a new Notes section that will most likely print on page 2 (duplex = back of sheet), but allows you to add additional notes or information about your character. The following feats are now auto-calculated into the sheet: Fleet of Foot, Tough as Nails, Wealthy, Extraordinary Defense, Two Weapon Defense, Natural Defense, and Lightning Reflexes. Some Feat awareness improvements, such as selecting attribute substitution and altering the view feats/banes/boons links to reflect the substitution. Translations for the character sheet, starting with French and Italian first. Filtering of feats without specifying prerequisites (such as from the character sheet link) will now ignore prereqs and display those feats and leave it to the player to ignore them. Fixed some minor bugs related to loading old character sheets prior to many weapons/armor changes. The previously titled Swift column is now either Advantage or Disadvantage, and while the rules state that the bonus is based on the slowest item you have equipped, the character sheet (since it lists ALL things you MAY equip) gives you the benefit of the doubt and lists SWIFT benefits, then SLOW penalities, then nothing (based only on the first dropdown of melee & ranged weapons). Weapon examples have been upgraded to match the new rules. This includes Wealth Level warnings if the item is too rich for you. Under Defenses, Other renamed to Feats to better organize bonuses clearly. Manually entered options in dropdowns will now properly display when viewing that saved character. Customizing Boons by name will save all columns for that row as well, allowing you to identify Boon Focus better. Example. Customizing Feats by name will save your manually entered cost. For example, typing in Bane Focus (Knockdown) manually with a cost of 3. Equipment moved to the bottom. Preferred boons now follows Actions in the main column. Weapons and armor now in the left column. Overall design still leaves room for longer descriptions without overflowing page 1. Character level is now highlighted as part of the list without having to click-through to the character sheet. Fixed guide's first message not showing. Added a step with tips on using the dropdowns. Armor updated to reflect Might -> Fortitude requirement change. Tooltip added. Tooltip on Attributes restricted to hover only (previously also on focus), as power users don't need to see it. Fortitude tooltip updated to be in sync with SRD. You can now view all characters created with the same Player Name, so use that field if you want to quickly find them again! Removed extra borders around weapons/armor. Fixed Feat and Boon row sizing when printing on Firefox. Added a 5th Feat row, adding it to tabindex as well. Fixed prerequisites to be Learning 3 OR Knowledge I, not AND. Filter fixed as well. Massive changes to weapons and armor, as well as a change to Evasion Resilience Guard requires fixes to the character builder. Might & Guard change has been incorporated. Armor has been reworked and updated. Note:This will break previously saved characters. All Feat cost changes are up-to-date (this is automatic). Weapons,as well as items influenced by them (e.g. swift) require a complete rework over the next few days. Sorry. Are done! Shrunk text size for Actions > Special. Made Agility and Fortitude lines editable within Defenses, to facilitate Attribute Substitution. Fixed unnecessary italics in actions and boons. Added non-printing buttons to feats, actions, and boons boxes to automatically display filtered feats, banes, and boons pages. Shrunk line-height of description to match the smaller text size. Shrunk text size of archetype to allow more text without breaking layout. Altered the layout and behaviour of equipment to be more user and printer friendly. You can now save your characters, creating a custom link that is displayed upon saving. This is an easy way to create a pre-gen or showoff your character to others. Tip: The custom link uses some or all of the character name, so make sure to add one! Perks and Flaws now have a combobox (dropdown or write your own) for selection. Stylesheet implementation now beats browser caching (no more manual hard reloads). Improved XP logic to effect level, feat points, and attribute points properly. Swift is now calculated loosely; it's based on the highest swift score from either melee dropdown as well as the the first ranged weapon dropdown. You can manually correct the field as usual. Feat select added. Guide updated to reflect that feat benefits (e.g. armor or speed bonus) are currently not automatically calcuated. Tabbing extended through the entire sheet. Next Feature Goal: Save your character sheet (custom link). Just some easy copy/paste links to display filtered feats, banes, and boons for your Roll20 characters. There is now a guided tour to help you get started! Adjusted feat box layout to better match style used throughout sheet. Added tabindex for moving through the sheet in a more orderly fashion, starting with the Player's Name. Autofill active for: level, xp, attributes, wealth, speed, initiative, and defenses. Includes color warnings when out-of-bounds (e.g. Attribute score higher than level allows). Added more editable content (defenses), since the builder isn't perfect (yet). Added Hit Point formula to sheet. Resized Actions for larger Name, smaller Special (and removed some excess padding). The current character builder is 100% printable (black & white) on Chrome and Firefox. You can also manually edit most of the fields. Coming Soon(ish)… Save and share your character build (this will take a while to get worked out) as well as translations. Do a hard reload (CTRL + SHIFT + R) to refresh the stylesheet. New Page: Perks & Flaws! Uses same style guidelines as other pages except Perks are listed first, then Flaws (as opposed to two separate pages). In most cases, the last sentence in a Perk's description is its effect, if any. The system automatically highlights the last line of each Perk. Styles and classes added to streamline printing. Tested on Chrome and Firefox. Features include: Hiding unnecessary web-only page elements, sizing, page-breaks, and auto-expanded cards. Do a hard reload (CTRL + SHIFT + R) to refresh the stylesheet (it's updated if the Filter Feats… button isn't visible in Print Preview). The Title of the window/tab will now reflect Filtered when it is a filtered list of feats/banes/boons. Spacing (top margin) added to the Apply Filter button for the Banes and Boons pages. Attribute Filtering: Feats Now Available! You can now filter Feat cards based on your character's attributes and any prerequisite feats. The shortcut link is a bit longer, but just as functional! Filtering is based on Tier 1 requirements only, which means that in the case of something complex like Death Blow, Agility 6 and Lethal Strike I are all that's required to show the card (there is no option to choose a higher level of Lethal Strike when selecting your filters). Fixed Tier 3 requirements for the Death Blow feat. Fixed feat prerequisite for the Multi-Target Boon Expert feat. Attribute Filtering: Banes & Boons, Now Available! You can now filter the Bane or Boon cards based on your character's attributes. There is also an easy to copy link to bookmark or share! Pro-tip: The number string is just the values (0-9) for all 18 attributes, in the order introduced in the Open Legend rules. Fixed/Updated the icons for Apple and Android devices. Updated incorrect background color for Special on mobile. Updated background color for Feat > Cost in Reference Card to match the background of the Cost badge. Added tooltips for the navbar's brand image (Home | Change Log) and for the OpenLegend link (which also now opens in a new window). A reference card was added to the front of the feats listing for clarification and to match the banes/boons styling. Verified visibilty across most types of color blindness: Deuteranopia (common), Protanopia (rare), Tritanopia (very rare). The Open Legend Boons have been added. Note: There are no unique features on the Boons page that do not already exist in other pages: Banes or Feats. By using static file caching, HTML minifying, and gzip compression, the page load is 50% smaller and 30% faster. Typical loading time is < 1 second in North America and < 2 seconds internationally. A 71 mobile, 89 desktop, and 100 user experience score from Google Page Insights. A 97 [A] score from Pingdom speed tests. The Open Legend Banes have been added. There is a reference card at the beginning to help people understand how to read a Bane. The Attacks are color coded based on the stat it is vs: Evasion, Toughness, or Resolve. The Duration is stylized to better isolate the duration from the method/limits to resist the Bane. Anchor links will now properly order query strings and anchors when a query string is present. Tooltip added to direct links upon receiving focus. When expanding the details of any card on a non-mobile screen, a new box at the bottom offers 1-click copy-to-clipboard of the direct link to that card, such as the Berserker feat. Anchor links will expand the card automatically on both mobile and non-mobile layouts. On non-mobile layouts it will also highlight temporarily to draw the visitors attention. Minimum Height of unexpanded cards increased to 240px to improve appearance in Chrome. Non-mobile: Showing/hiding details will now focus the page to the top of that card. The Open Legend Feats have been added. Unique mobile layout (responsive), based on an accordian design, to reduce scrolling. If a feat requires another feat, the label is clickable, automatically focusing and expanding that required feat. Color coding and spacing used to easier identify subtleties in attribute requirements. Desktop resolutions offer an expand/hide all option fixed to the left side. This product was created under the Open Legend Community License and contains material that is copyright to Seventh Sphere Publishing. Such use of Seventh Sphere Publishing materials in this product is in accordance with the Open Legend Community License and shall not be construed as a challenge to the intellectual property rights reserved by Seventh Sphere Publishing. Seventh Sphere Publishing and Open Legend RPG and their respective logos are trademarks of Seventh Sphere Publishing in the U.S.A. and other countries. The full-text Open Legend Community License can be found at https://openlegendrpg.com/community-license.